Milan is one of the most important and stylish cities in Italy and is full of history. There are countless impressive buildings in the city that have tremendous character, in many different styles ranging from old Neo-classical Milanese palaces (palazzos) to ultra-modern towers and office blocks. The commercial metropolis is home to many important business centres, financial institutions and Italy's stock market. Milan is also known throughout the world for its leading high fashion and design excellence. Shopping opportunities are at their very best in the Golden Quad area, where streets are filled with leading fashion houses. The Via Marconi is the location of Milan's main tourist information centre, while further tourism offices are based at the Stazione Centrale train station, as well as at both the nearby Linate and Malpensa airports. As a general rule, visitors to the city will find that hotels can be expensive, although there are often some great bargains to be found. Milan hotels, as with all Italian hotels, are rated on a star grading system, with the highest rated offering the ultimate in luxury. At the cheaper end of the accommodation scale are the basic rooms of the hostel (ostello) and guest house (casa di ospite), as well as several campsites (campeggio). Do bear in mind that finding yourself a bed during the fashion weeks can be quite a challenge. 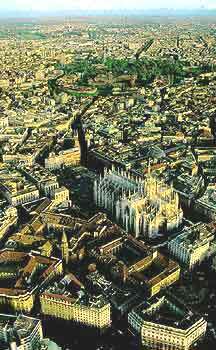 Reliable lodging is to be found around the Duomo cathedral, the Stazione Centrale and the Porta Garibaldi. Just a relatively short distance from Milan are a selection of cheaper hotels, located in the neighbouring cities and towns of Bergamo, Como and Cremona. 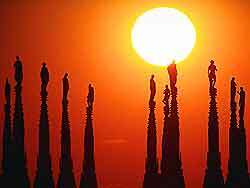 Most of the main attractions in Milan are located in the city centre and there is plenty to see. Amongst the many sights not to be missed is the simply enormous Milan Duomo - the third-largest cathedral in the world, taking some four centuries to finish; the Castello Sforzeco - a fortress built in 1368 that later became an elegant and stunning Renaissance residence; the Teatro alla Scala Opera House - completed in 1776 and hosting some superb theatrical productions; and Santa Maria delle Grazie - an elaborate church dating back to 1463, where Leonardo da Vinci's famous painting 'The Last Supper' is on display. There are also numerous art galleries and museums in Milan, such as the Pinacoteca di Brera Gallery - housing one of Italy's most important art collections; the Villa Reale and Civica Galleria d'Arte Moderna - featuring masterpieces by famous artists, such as Grassi, Matisse and Picasso; the Palazzo Bagatti-Valsecchi - considered to be one of the finest museums in the whole of Europe, with many outstanding displays and collections; and the Civic Archaeological Museum - where you will discover the world's oldest wooden plough still in existence, dating back around 4,000 years. More information about Milan Tourist Attractions. One of the most famous streets in Milan is Via Montenapoleone, where many of the world's leading Italian and international fashion designers are concentrated. Throughout the year there are numerous exciting and important fashion shows in the city, where the latest collections go on show. There are also many other popular celebrations both in and around Milan, including the Gran Premio di Monza - the Grand Prix of Italy held at nearby Monzo, Carnevale Amrosiano - the longest carnival in the world, and the Fieri di Chiaravalle - a famous fair in the bell tower of the Chiaravalle Cistercian abbey. Not to be missed are the many splendid and unforgettable lakes nearby Milan, offering superb facilities for visitors, with shops, restaurants and cafés lining the lake fronts. Some of the most popular lakes in this region include Lake Maggiore, Lake Como and Lake Garda, the three largest lakes in Italy.